It seems that everyone looks forward to celebrating Easter, although perhaps from varying reasons. For some, Easter really signals the beginning of spring. No matter what specific date Easter falls on in a particular year, we somewhat think of it as a true transition from the doldrums of winter to the new life of spring. For others, Easter signals the time to think of flowers, gardening, getting the lawn ready for summer, beginning to think of a possible vacation place and time, etc. This group thinks tulips, daffodils, lilies, begonias, hyacinths, daisies, azaleas, etc. Many people see Easter as a time to look for and to purchase a new outfit for the day and for the season; new clothes usually bring a new spirit and a sense of renewal. Still others look to Easter as a time to do spring cleaning and fixing up the house to brighten one’s spirits. All of these are most worthwhile, and they bring great joy and excitement. But for a disciple of Jesus, Easter is more about resurrection and victory, conquering sin and opening heaven for eternal life. It is about unselfish love and magnificent wonder, about how far God will go and has gone for us, his children, even after we have disobeyed and chosen paths that seemingly would lead to goodness but actually have led to destruction. Easter is about crosses vanquished, empty tombs brilliant, and messages of great joy summed up in those three great words, HE IS RISEN! It’s about life conquering death, sun piercing the darkness, good over evil, hope rather than despair. Too often we feel overwhelmed by what we see happening in the world. We wonder whether there will ever be a time of great peace when it seems that warfare is everywhere. We shudder about the lack of respect of one human being for another, when someone can just shoot a person in a parked car or on a front porch. How many more times do we have to read about people being gunned down at a place of worship or outside a clothing store or near a bar as happened a short time ago to a police officer in Chicago? We question whether poverty can ever be addressed so that no one lacks food, water, basic housing and clothing. We sometimes feel abandoned by friends or even by God, and we lose our focus. “Let all pious men and all lovers of God rejoice in the splendor of this feast. Let the wise servants blissfully enter into the joy of their Lord. Let those who have borne the burden of Lent now receive their pay, and those who have toiled since the first hour, let them now receive their due reward. Let any who came after the third hour be grateful to join in the feast, and those who may have come after the sixth, let them not be afraid of being too late, for the Lord is gracious and He receives the last even as the first. He gives rest to him who comes on the eleventh hour as well as to him who has toiled since the first: yes, He has pity on the last, and He serves the first. He rewards the one and praises the effort. “Come, you all: enter into the joy of your Lord. You, the first, and you, the last: receive alike your reward. You rich and you poor, dance together. You sober and you weaklings, celebrate the day. You who have kept the fast and you who have not, rejoice today. The table is richly loaded; enjoy its royal banquet. The calf is a fatted one; let no one go away hungry. All of you enjoy the banquet of faith. All of you receive the riches of his goodness. Let no one grieve over his poverty, for the universal kingdom has been revealed. Let no one weep over his sins, for pardon has shown from the grave. Let no one fear death, for the death of Our Savior has set us free: He has destroyed it by enduring it, He has despoiled Hades by going down into its kingdom, He has angered it by allowing it to taste of his flesh…. A joyous Easter to one and all from the friars and staff at St. Peter’s! The Easter Vigil is the culmination of the Triduum. In the church’s earliest centuries, the Vigil lasted through the night, but over the centuries it was shortened. By the 16th century it had disappeared, being replaced by Easter Sunday Masses. 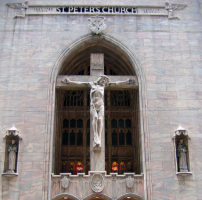 With the church’s reform of the liturgies of Holy Week in the 1950s, the Vigil returned. For many involved in ministry, it is the highlight of the church year. Done well, it can be a graced moment for those who participate in it. Though not narrated in tonight’s readings, we know that sin entered the world as a result of human choice. But God continues to reach out to people over the course of salvation history. In the Abraham story, we hear of election and a covenant of promise and blessing. In Exodus the people are rescued from slavery in Egypt and from death by the power of the sea. Through Isaiah God proclaims, “With great tenderness I will take you back,” and then, “Listen, that you may have life.” In Baruch we are called to “hear the commandments of life.” And from the prophet Ezekiel we hear, “I will give you a new heart and a new spirit.” Sin and death will not be victorious. God seeks to restore a fallen humanity. Luke’s narrative tonight tells us that the women who go to the tomb are greeted with unexpected news: “Why do you seek the living one among the dead? He is not here, but he has been raised.” As Joan Chittister says in The Liturgical Year, “We are also the followers of the Light that shines beyond the grave.” After celebrating tonight’s Vigil, may we strive to always walk by that light and share it with the world. For Reflection: Which of tonight’s readings has a special meaning for you? How can I more fully walk by Christ’s light? We hope many people will choose to join us for the Easter Vigil at 7:00 P.M. Not only is this liturgy the highlight of the liturgical year, but it is celebrated in such a way that we meditate on how God has revealed himself through the ages, then how Jesus has given his life and death for our salvation, how the early Church came to realize that Jesus indeed was raised from the dead along with all the implications of that reality, and how all of this has been passed down to us through the power of the waters of Baptism right down to this very night. Even though we do not have anyone being baptized or making their profession of faith tonight at St. Peter’s, we will all renew our baptismal promises and then be sprinkled with the newly blessed Easter water. We invite everyone who participates in the Easter Vigil to join us down in the St. Clare auditorium after the ceremony for a reception. We can then share the joy of what we have just celebrated with one another. Alleluia! Christ is risen from the dead! Today’s readings remind us that this acclamation is about more than looking back. It also anticipates the time when our lives will be united with Christ in glory. The Gospel’s recounting of Mary Magdalene coming upon the empty tomb is interrupted by the story of Peter and the Beloved Disciple arriving at the tomb. The men enter and see the burial cloths, then go home. The verses after the conclusion of today’s Gospel show that only Mary remains at the tomb. Twice she hears, “Woman, why are you weeping?” Twice she laments that she cannot find Jesus’ body, but then the Risen Lord calls her by name and she recognizes him. He commissions her to go to the disciples as an apostle of the Resurrection. The Second Reading addresses the impact of Christ’s Resurrection for all of us. Our life is hidden now in Christ, but when he returns, we, too, will appear with him in glory. Alleluia! As Peter addresses the disciples in the First Reading, we hear him recall Jesus’ work among them. Pope Francis calls to mind Christ’s work among us, the evangelizers of today, when he speaks of our work of evangelization in The Joy of the Gospel: “The joy of evangelizing always arises from grateful remembrance. The apostles never forgot the moment when Jesus touched their hearts. This remembrance makes present to us ‘a great cloud of witnesses.’ Some of them were ordinary people who introduced us to the life of faith. The believer is essentially ‘one who remembers’(#13). In the reading from Acts, Peter explains that they were chosen to be eyewitnesses of all that Jesus did and that they have been commissioned to preach and to testify, even though they could be persecuted. Such testimony is still to be made today, Pope Francis states in The Joy of the Gospel: “The disciple is ready to put his or her whole life on the line, even to accepting martyrdom, in bearing witness to Jesus Christ, yet the goal is not to make enemies but to see God’s word accepted. An evangelizing community is filled with joy; it celebrates at every small victory, every step forward” (#24). Peter’s speech to the disciples in Acts appears to provide direction for their lives. They are the ones who know what has happened all over Judea. Not only have they been eyewitnesses, but Peter reminds them that they have been commissioned to testify and preach. In The Joy of the Gospel, Pope Francis explains that God is with us as we seek reason in what we do. “God’s presence accompanies the sincere efforts of individuals and groups to find encouragement and meaning in their lives. He dwells among them. God does not hide himself from those who seek him with a sincere heart, even though they do so tentatively, in a vague and haphazard manner” (#71). For Your Reflection: What does it mean to you to be chosen by God? During Easter Time, how can you seek what is above? When have you more clearly understood a truth about God? As we walk on our life journeys in this world, we may often feel overwhelmed. Struggle and suffering can mark our lives because of health issues, job insecurity, family concerns, or the painful loss of a loved one. The world itself, in Saint Paul’s words, “has been groaning” (Romans 8:22), as it struggles with wars, violence, ecological degradation, economic injustice, and natural disasters. And as we are keenly aware this past year, the Church herself has struggled mightily with the shameful legacy of abuse and its mismanagement. It seems that the landscape of our lives is entirely shaped by struggle and suffering. And that might seem to be the sum and substance of it all, but, in faith, we know that it is not. Our celebration of the Lord’s Resurrection in this Easter season opens our eyes beyond this desperate landscape to a new and hope-filled horizon. There is more to this story than our struggle and suffering. In the Resurrection of Jesus, we can begin to see a new life ahead of us that God offers to us.